Since 1995, Quipbrokers has specialised in equipment and material supply, surplus management, asset sales and liquidation services. Our equipment database covers the offshore, petroleum, drilling, subsea, ship and marine industries. It contains equipment for sale and for rent and equipment wanted. Most of the listings are for equipment or material that is surplus to the owner’s requirements with a new / unused status or used surplus. For buyers, the database helps to quickly locate available equipment and material for projects and operations. Quipbrokers’ services are offered all over the world at no cost to clients until equipment or material has been sold. We can also supply used and unused equipment ‘as is’ or fully overhauled and certified (DNV, ABS, LRS) according to our customers’ requirements. Delivery can be made to any location in the world by air or sea freight. If you allow us to list your equipment or material on our website, we will contact you if we locate a buyer. There is no upfront cost associated with this service. The purchase and sale process is based on common international trade terms and conditions. We can offer storage facilities for consigned equipment and material in several locations around the world. If required, our clients’ surplus material may be preserved and stored at these facilities. This white paper provides full details about Quipbrokers' offshore crane and workover well intervention equipment package. 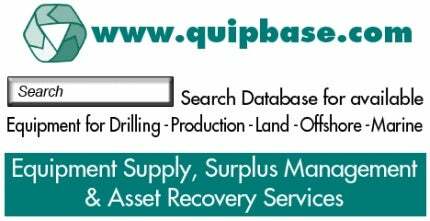 Quipbase.com is an equipment database covering the oil and gas, drilling, offshore, subsea, shipping and maritime industries.